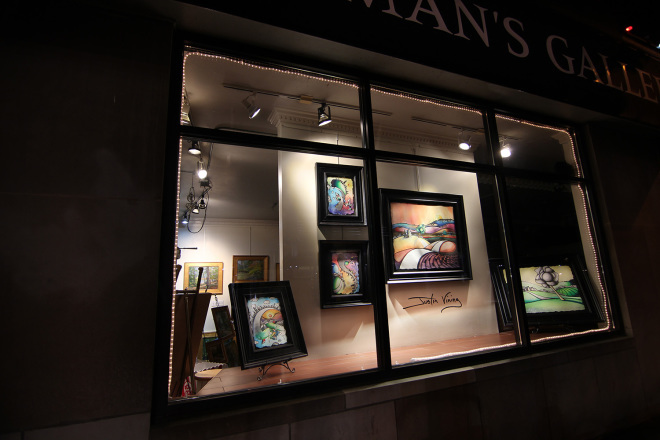 A year & a half ago I walked into Sigman's Gallery in Broad Ripple for the first time. It was about 2 weeks before the Broad Ripple Art Fair and I heard through the grapevine that at that time Sigman's had a small warehouse with some beautiful second hand frames that could be purchased at a discount. I figured it couldn't hurt to go see what they had. When I got to the gallery, Mike Sigman, the gallery owner, was already at the warehouse so I just went over. It didn't take me long to figure out that Mike was an incredible person with a genuine interest in helping artists out. I walked out of that warehouse spending almost nothing & acquired 12 beautiful frames. I used those frames to present my work for the Broad Ripple Art Fair. I learned a valuable lesson that year having sold 16 of the 20 original paintings I took to the show. That lesson, professional presentation goes a long ways when selling art. After that show I frequently visited Sigman's and ended up becoming good friends with Mike & his 2 employees, Katie & Chip. All 3 of them have spent countless hours teaching me both the proper ways to professional present my work but also all sorts of information & advice about how to navigate the complex world of being a full-time artist. Last Thursday when Mike asked me if I had any interest in displaying my work in his gallery, it was a no brainer. He represents some of the best painters in the Midwest and I am honored to have my work displayed alongside theirs.